Transparent keyboard labels are useful to protect keyboard legends or special printing from being rubbed off in use. 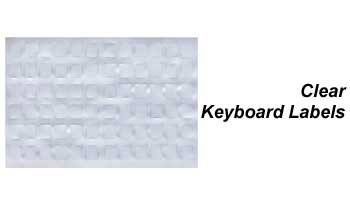 Transparent Keyboard Labels - Suitable for protecting the original printing on keyboards. The label set includes 72 clear labels that fit standard keyboard and laptop alphanumeric keys. DataCal keyboard labels are designed to fit desktop and laptop computer keyboards. Laptops with smaller than standard keys may not be compatible with the DataCal label sets.